Note it down on your calendars. 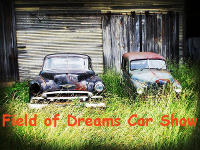 Field of Dreams Second Annual Car Show is scheduled for Saturday and Sunday November 23 & 24, 2019. More show cars, more vendors and best of show car awards.